Not looking good. The showers from last week were enough to keep the grass green but did nothing to creeks and groundwater. I heard before the term "green drought". Think this would apply here. I'd much rather see a strong high with a deep mean easterly flow driving stream showers onto the coast(typical Feb) then this pseudo-spring storm pattern. I see very little moisture flow into these troughs and hence, a repeat if anything of last nights storm where about 50 heavy drops fell and it barely registered in the gauge. Whats was noteworthy about last weeks pattern was the paltry incursion of the showers south of the border. Normally reliable high summer rainfall locations like Cape Byron barely broke 10mm over the week, Ballina didn't make 5mm. Thats the second strong MJO phase, and in this case monster monsoonal surge that has resulted in a total failure of the normal summer moisture incursion into the sub-tropics. I see no break in that pattern. Worse, if anything. I thought there was a glimmer of hope a few weeks ago but yeah, nothing came of it for the southern half of the country. There also seems to be this common misconception around here that the Tasman Sea high automatically equates to dry 'boring' weather which is not always true. Oswald consisted of two double-highs over NZ which fed into an inland trough over inland QLD. Jan 1974 also consisted of very dry, anticyclonic conditions through NZ while as everyone knows, Queensland was very, very wet. There are many more examples of this but those are just a couple. As I've said in the Climate Drivers thread a while ago, there's more to it than just looking at a MSLP chart and identifying the 'H' in the Tasman Sea. I agree with you re the current pattern. I do think it tried to return to a more typical February pattern this past week with scattered onshore showers returning in a (finally) moister, elongated ridge but now we're back where we started - weak ridge, rubbish moisture infeed and garden-variety storms at best. Great if you like to swelter in hot days and photograph storms, terrible if you want some proper rainfall. I’m officially done with his crap weather  can’t believe it hasn’t rained this year, this is my wet season to get me through winter. Just devastating. Also a lot of dry southerly air being dragged up behind Thursday's front. Not good. CFS is still holding on to a wet signal for SEQ in March, just a good little storm pass through in Kingaroy. Watching the skies midday yesty and noticed on radar that line way out to our SW - mid late afternoon i noticed quite a bit of mid level cloud flinging down from the Nrth and a bit later was turning to the SWst, thought this could get interest,, then squizzed the radar again, low-&-behold showed some good promise with the building intensity ! Looking a bit interesting Tues arvo from what I can decyfer with stormcast, some LI's, also good sheer through the levels, and modest moisture feed during the later afternoon evening - that said, I most likely missing other more important factors, eg, is there capping, a dry slot, not enough moisture etc ?? On a happier note, I had 5.5mm last night in a light thundershower. Won’t make much of a difference, but it did remind me that it can actually rain out here. 4.8mm in the 24hrs to 9am from the two storms yesterday. The highest fall was 60mm at Stuarts Island near Nambucca Heads. The storm that moved through the Nambucca Valley during the afternoon was able to fully transition into a surface-based storm and tap into the 22-23°C dewpoints. Whereas most other storms yesterday tended to be higher-based and so brought lesser rain in comparison. An invasion of drier air on the MNC behind the change with dewpoints getting as low as 11-13°C earlier today. Even if it will be just for a day, it's nice to have a break from the humidity though. We got a green drought down here James.After a couple of showers lately that would barely top up a tank , everything has greened up real nice. Must be the nitrogen enriched rainwater that does the trick. By the way Mega, you made mention about our friend the Tasman High.No doubt they provide the mois indeed for those troughs.We should differentiate here and curse the Squidge, that "nose" like projection off the highs that hangs round for days, weeks sometimes.Thats the puppy that gives us so much grief and be worthy of cursing. ....and we hate it down in Gippsland Vic too. Yes Ken has mentioned that a few times about not just looking at the surface etc.. My point is if you look up the meaning of high pressure, it will say a high will give you fine and settled weather. Low pressure will provide rain and unsettled weather. Then again you can have low pressure in Darwin in the dry season, but its fine weather. The East coast of Australia must be very unique compared to other parts of the world where you can easily rely on having a Barometer on your wall. A welcome strong breeze here at the moment. Perhaps a hint of a promise of things to come? Hmm speaking of breeze. The isobars are very far apart on the synoptic and l was expecting little to no wind as l was taught that wide isobars mean low wind. Well was surprised as we had quite a strong breeze here on the coast at times and even some strong winds west of the divide. There must be something else ? 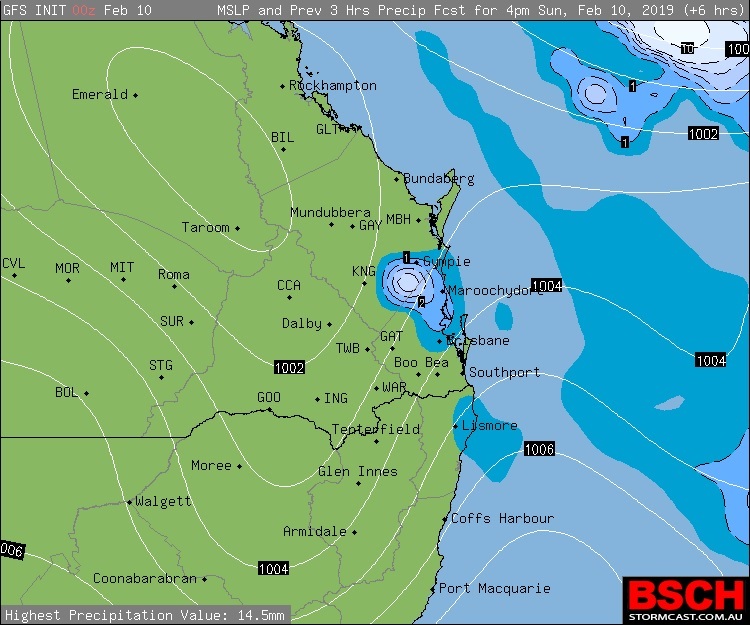 When was the last time SE Qld had a wet March/April/May? Tomorrows surface synoptic . Quite interesting. The high in the Bight has been replaced by a strong zonal westerly belt. The sub polar latitude looks like it might be cranking with some bends. This one covers Tasmania as it passes. This is often seen in Autumn and winter.Likely drop in the AAO occurring. Notice the very wide apart surface gradient over the mainland once again. I won't say light winds for our area because today it was windy. So expecting the same tomorrow. Surface winds advecting toward the Coral sea low ot towards the west NZ low. I suspect.? The SE'lies were rushing up behind the trough today. 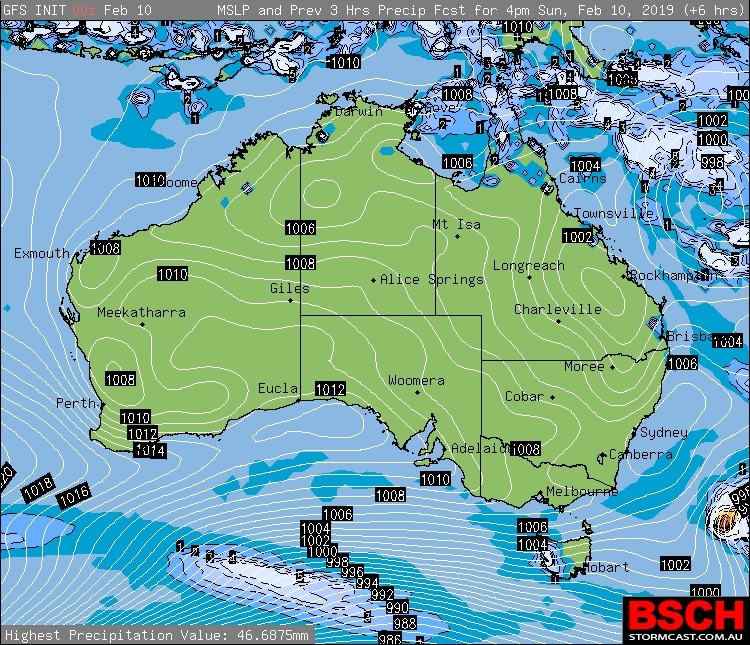 Keep in-mind the isobars on the BOM's ACCESS model map and BOM's synoptic chart are in intervals of 4hPa. So what can look lazy, can sometimes be a bit busier than it looks, especially when there are troughlines about. 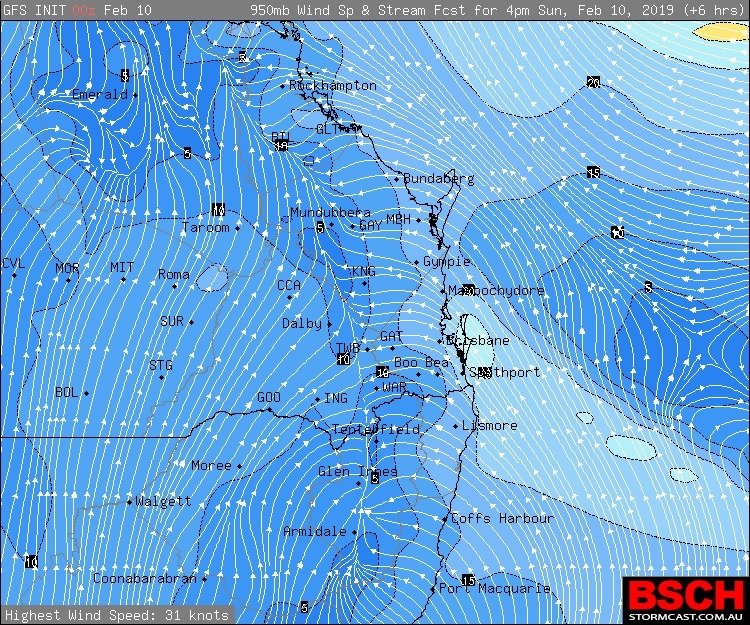 Here's what the 00z GFS forecast run had for this afternoon at 4pm EST, showing the MSLP about our region and across Australia (isobars shown in 1hPa intervals), plus the wind streamlines for our region too (in knots) showing the stronger SE'lies rushing up behind the trough out at sea. Not much to say about the current weather other than the humidity this morning was oppressive. 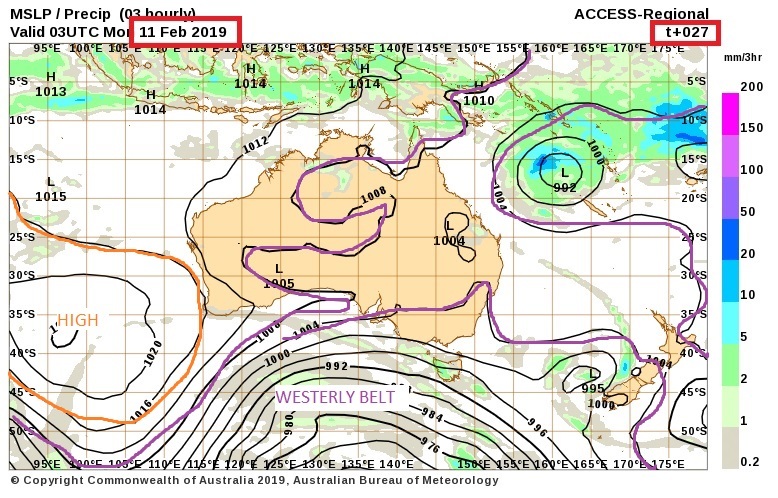 Coral sea looks interesting in the forecasts for the broader western pacific, but for SE Qld and NE NSW appears not much in it compared to the moisture that we would normally expect in midst of January to March weather. CURRENT WEATHER...........7/8 cloud, nearby showers. PAST 24 WEATHER SUMMARY... Overnight and early morning showers developed. Thankyou so much 'seabreeze' for looking into that. Very informative and interesting. The zoomed in 1km surface wind sure gives much greater detail. I will use that. Does UKMET or ACCESS have a similar product. (1km intervals for MSLP).